Nigeria’s economy will be earning over $560 billion when Lekki Deep Sea project finally takes off in 2020 with an estimated $361 billion generated from the port’s concessioning in addition to $200 billion coming from taxes and revenue. 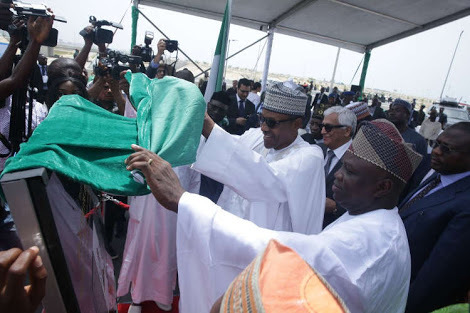 Speaking during the flag-off of the deep seaport, President Muhammadu Buhari disclosed that over 170,000 direct and indirect jobs would be generated from the project. According to Buhari, the project targets about 1.5 million 20-foot Equivalent Units (teus) container capacity annually, which is expected to grow to 2.7 million and 4.7 million teus when the port begins operation. Daily Sun reports that the President who was represented by the Vice President, Prof. Yemi Osinbajo, said the port, when operational, would receive larger vessels such as Panamax and post-Panamax vessels. “The promoters of this project are targeting about 1.5 million teus container capacity yearly, which we expect to grow to about 2.7 million and 4.7 million teus when the project operation commences. With this, the Lekki Deep Seaport will become one of the best deep water ports in our region and serve as hub for port operations in the whole of West Africa. “The promoters also planned to dredge the port channel to about 16 meters, which is not currently obtainable in any port in the country. This is an indication that ships of larger capacity, Panamax, post-Panamax ships and very large crude carriers will now be able to visit the port, and greater efficiency and economies of scale will generate significant revenue for Nigeria’s economy,” he said, noting that the Federal Government has in the past two budgets provided an aggregate of N90 billion for the development of special economic zones. He added that the deep seaport project is in line with the objectives of creating such economic zones.